All Web addresses mentioned were functional as of 3-31-17. From the Cumberland Gap to the Atlantic Ocean, this is Virginia Water Radio for the week of April 3, 2017. This week, music called “Storm” by Torrin Hallett, a student at Oberlin College and Conservatory in Ohio, sets the stage for a storm-related mystery sound. Have a listen for about 15 seconds, and see if you can guess what’s making this sound. And here’s a hint: What high-altitude, icy creation ranges in size from a garden pea to a softball or even bigger? If you guessed hail, you’re right! You heard the sound of small hail hitting a car in Blacksburg, Va., during a brief storm on March 18, 2017. That relatively mild hailstorm did little damage, but annually in the United States, hail typically causes at least hundreds of millions of dollars in damage to property and agricultural crops. Hail forms inside thunderstorms, thousands of feet high in updrafts of warm, human air. There, as moisture rises and cools, water droplets can freeze around particles called ice nuclei. In strong updrafts, a frozen droplet can be held aloft and repeatedly encounter droplets of supercooled water—that is, liquid water below the freezing point—adding more ice and forming a hailstone. 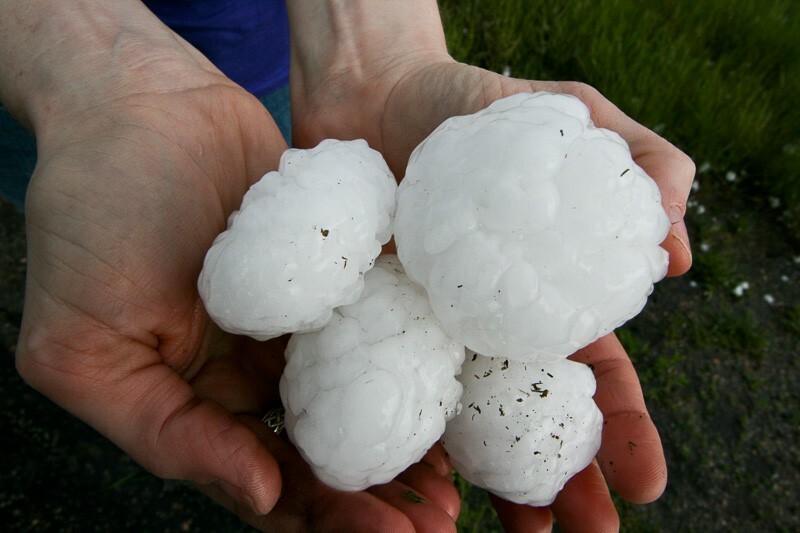 A hailstone’s size depends largely on how strong, large, and long-lasting the updrafts are, determining how long a growing hailstone can be supported aloft. Hailstone diameter can range from about the quarter-inch of a garden pea, to the four inches of a softball, to the eight inches of the largest recorded hailstone in the United States, which fell in South Dakota in July 2010. Not all thunderstorms produce hailstorms, of course. But hail of 1 inch or more in diameter is one of three criteria—along with tornadoes or wind gusts of 58 miles per hour or more—that the National Weather Service uses to categorize thunderstorms as severe. We close with a few more seconds of Torrin Hallett’s “Storm”; followed by about 20 seconds of “Hail Improvisation,” created in March 2017 by Williamsburg, Va., third-grader and hammered-dulcimer student Simon Fass. Thanks to Torrin, Simon, and Simon’s music teacher Timothy Seaman for providing this week’s music for hail. “Storm,” a movement from “Au Naturale,” is copyright by Torrin Hallett, used with permission. Click here to listen to the full version (1 min./44 sec.). In 2016-17, Torrin is a fourth-year student at Oberlin College and Conservatory in Oberlin, Ohio, majoring in horn performance, music composition, and math major. More information about Mr. Hallett is available at his Web site, http://www.torrinjhallett.com/. “Hail Improvisation” was created March 23, 2017, by Simon Fass in a hammered-dulcimer music lesson with Timothy Seaman; used with permission. In 2017, Simon is a third-grader in Williamsburg, Va. Click here to listen to the full version (2 min./20 sec.). More information about Mr. Seaman and his music is available online at http://timothyseaman.com/en/. Click here for the full version (2 min./22 sec.) of the “Shenandoah” arrangement/performance by Ben Cosgrove that opens and closes this episode. More information about Mr. Cosgrove is available online at http://www.bencosgrove.com. Small hail pellets on the ground immediately following a one-to-two minute hailstorm in Blacksburg, Va., March 18, 2017, about 6 p.m.
Clouds immediately after short hailstorm in Blacksburg, Va., March 18 2017, about 6 p.m.
Large hail photo from the National Oceanic and Atmospheric Administration (NOAA)/National Severe Storms Laboratory, “Severe Weather 101—Hail,” online at http://www.nssl.noaa.gov/education/svrwx101/hail/. Stanley Changnon, “Trends in Hail in the United States,” part of the Workshop on the Social and Economic Impacts of Weather, April 2-4, 1997, Boulder Colorado; online at http://sciencepolicy.colorado.edu/socasp/weather1/index.html (click on Table of Contents to find link to specific talks). Insurance Information Institute, “Hail,” online at http://www.iii.org/fact-statistic/hail. C. Knight and N. Knight, “Hail and Hailstones,” pages 924-929 in Encyclopedia of Atmospheric Sciences Volume Three, James R. Holton et al., eds., Elsevier Academic Press, London, 2003. National Oceanic and Atmospheric Administration (NOAA)/National Severe Storms Laboratory, “Severe Weather 101—Hail,” online at http://www.nssl.noaa.gov/education/svrwx101/hail/. NOAA/National Weather Service/Columbia/S.C. Forecast Office, “Hail Awareness,” online at http://www.weather.gov/cae/hail.html. NOAA/National Weather Service/Storm Prediction Center, “Frequently Asked Questions,” online at http://www.spc.noaa.gov/faq/ (question 4.2 is “How does the NWS define a severe thunderstorm?”). NOAA/National Weather Service/Storm Prediction Center, “Storm Reports,” online at http://www.spc.noaa.gov/climo/reports/today.html; and “Annual Severe Weather Report Summary 2015,” online at http://www.spc.noaa.gov/climo/online/monthly/2015_annual_summary.html#. At the former site, users can search for preliminary reports across the United States of hail or other severe weather for any given day. WTVR TV – Richmond, Va., Storms dump hail across Central Virginia, 2/25/17. Episode 106, 4/9/12 - Weather watches and warnings. Episode 152, 3/11/13 - Weather balloons. Episode 342, 11/14/16 - Tornado research via virtual reality. Episode 358, 3/6/17 - Tornado preparedness.